This paper deals with the a story of Buffalo Bill and a Town Tough in Towanda Pa as well as a well known revenue gent Captain Jim Davis in Tennessee. 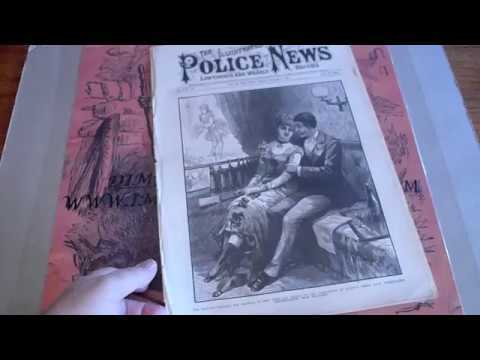 This issue is in very good condition view the video for the absolute best description. The pages are tan to off white colored and suppl, pages have slight edge wear and age staining as expected with a book that is 140 years old. (See scan for further details.) If you have a particular issues or newspapers you need for your collection drop us a message through Ebay . The Illustrated Police News was a weekly illustrated newspaper which was one of the earliest Yellow Journalism tabloids. It featured sensational, bloody, racist and melodramatic reports and illustrations of murders and hangings and was a direct descendant of the execution broadsheets of the 18th century. I am not a grader so I make sure the scans are close and as detailed as I can make them but that the video is the best description. We have many other we have or will be listing if you have any questions just e-mail me through EBAY or at our web site imaginationradio com . This is one of 800 "Beadle's Dime Library, Nick Carter Library, Old Sleuth Library, &"The Shadow Magazines" as well as several thousand dime novels we will be placing on EBAY and in our site store over this year. Any questions or special requests please email us. We always try to list any items that are requested as quickly if we can. Click the button below to add the ILLUSTRATED POLICE NEWS #890 1883 BUFFALO BILL CAPT JIM DAVIS REVENUE MOONSHINER to your wish list.